Crohn’s disease describes an illness where the gastrointestinal tract of humans becomes chronically inflamed and easily irritated. Ulcers commonly develop in the intestines of people with Crohn’s disease, which leads to s sensitivity to certain foods, frequent diarrhea, and bloody stool. The Crohn's and Colitis Foundation of America (CCFA) estimates that up to 500,000 people in the United States suffer from Crohn's disease. The primary symptoms of Crohn’s disease are the same symptoms that classify most intestinal diseases—abdominal pain and diarrhea. Because there is no one symptom that clearly indicates the presence of Crohn’s disease, the National Institute of Health (NIH) recommends a detailed personal history, physical examination, and significant laboratory testing. Beyond abdominal pain and chronic diarrhea, victims of Crohn’s may experience blood in stool samples, weight-loss, skin issues, and fevers (NIH). Frequent blood loss in stool samples can lead to a low count of red blood cells in the body (anemia), and therefore a victim of Crohn’s may also experience tiredness. Children with Crohn’s disease can experience a stunt in growth. There are many theories on how Crohn’s disease works, but the most popular belief is that the body perceives bacteria and certain foods as “invaders” of the intestines (NIH). To combat theses invaders the tissue of the intestines becomes agitated and inflamed. Many doctors require a colonoscopy, or a biopsy of intestinal tissue to determine that Crohn’s disease is causing intestinal irritation. 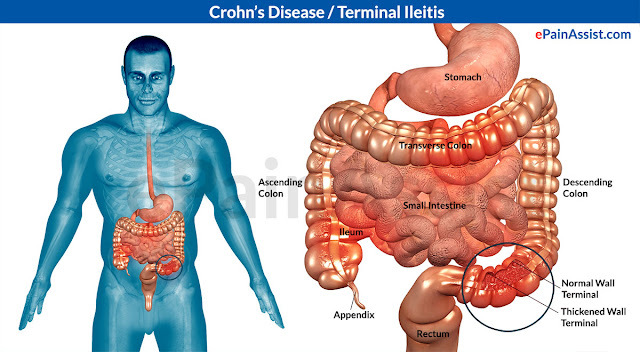 Crohn’s is a chronic disease, which means that it will persist for an extended period of time. Crohn’s disease cannot be cured, but it can be treated. Treatment for Crohn’s disease aims at eliminating or lessening the degree to which bowels become irritated. This generally includes a change in diet to foods that do not irritate the bowels. Many Crohn’s victims find that highly carbonated beverages such as beer or soda are particular agitators of the intestinal tract. Beyond changes in diet. Crohn’s victims are often given drug treatments aimed at reducing or eliminating inflammation. These may include anti-inflammatory drugs, or immunomodulators (Mayo Clinic). In severe cases of Crohn’s disease surgery may be conducted to remove the tissue that is causing inflammation. Once this tissue is removed the healthy ends of the intestine are reunited. Nutritional supplements can also be used to treat Crohn’s disease as many nutrient-rich foods may be causing irritation in the intestines. Nutritional supplements present a way for Crohn’s victims to maintain a healthy diet without consuming irritating foods. Crohn’s disease can be a mysterious and debilitating disorder. It is essential for people with Crohn’s disease to inform doctors of their diets, family history, and stool consistency if they want an accurate diagnosis and eventual relief from the disease.